Do you have a project you just don't seem to find the time to work on? 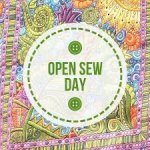 Sign up for the Open Sew and give yourself a block of time to get that project done, or at least a good start on it! Bring your scissors, knives, or gardening tools to be sharpened. Cash payment only. Scissors $6; Rotary Blades $3; Knives $5, price will vary for other items. Have a project you need a little direction to start, keep going, or finish up? Bring your project and there will be an instructor available to help you with your needs. Next date to be determined. As soon as we have a date, we will post it, thank you for your patience. 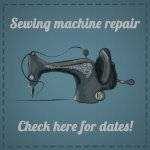 Mr. Cubbage will be at The Fabric Shoppe to repair and service Sewing Machines & Sergers. Check here to find the next date, then call or stop by to get your name on the service list.